Can’t turn your brain off at night? Can’t seem to stop worrying the night away? The more you worry over the fact that you can’t seem to fall asleep, the more you won’t be able to sleep. It’s funny how the brain works but like all other things in life, the more you focus on an ‘issue’ the bigger it seems to get and the more it starts to cloud and take over your mind, clicking your brain gears to stay focused and obsessed over that one ‘issue’ (could pertain to your fears, your addiction, your negative memories, etc.). 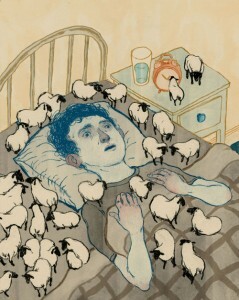 CDC reports that 50 to 70 million Americans suffer from insomnia. It’s become such a widespread issue that March 9th has become “National Insomnia Awareness Day”. In the past, many turned to prescribed medication to help soothe their restless nights but you have to trust me on this, medication is not the best answer. Hypnosis can help you fall asleep faster every night and it can help you fall asleep more quickly after waking up during the night. Insomnia can be tackled with just two simple things: hypnosis and lifestyle changes. Many clients that come to see me tend to have anxiety or depression that ties into their reason for insomnia while the other handful have unbalanced eating and drinking habits that prevent that from having a good nights sleep. There are many dangers to insomnia that people overlook and take lightly. Insomnia not only leads to anxiety, depression, headaches, arthritis, and in serious cases heart attacks, but it also causes serious cognitive impairment. It leads to deterioration to an individuals attention span and memory bank (your ability to recall events, places, details and emotions). These are serious long term effects that should be addressed through hypnotherapy. This entry was posted in depression chronic, Gluck Solutions, Hypnosis and Depression, hypnosis anxiety, hypnosis nyc, Life Coach, life coach new york, power of thinking, sleep disorders and insomnia, stress remedies and tagged anxiety, depression, hypnosis, hypnotherapy, insomnia, NYC by Dr. Errol Gluck. Bookmark the permalink.